Yo. A new app that makes you do one thing. You are here: GeekSays Technology News » Android » Yo. A new app that makes you do one thing. The word seems so meaningless, yet we discovered that it can have a profound meaning. 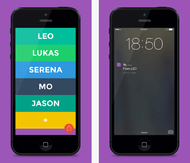 The app, called Yo, lets people say “Yo” to their friends. Tap a name on the app’s list of contacts, and a text notification saying “Yo” pops up on the recipient’s smartphone, along with a recorded voice shouting the syllable. The idea is simple. It may turn out to be a dud. But $1 million has already been staked on its success. Or Arbel, the chief executive of Yo, said on Wednesday that he had raised that seven-figure sum from a group of angel investors led by Moshe Hogeg, the chief executive of an image-sharing app called Mobli. Yo has so much potential, Mr. Arbel said, that last week he left his job as the chief technology officer of Stox, a stock trading platform he helped start last year, and moved to San Francisco from Tel Aviv to work on Yo full-time. The app doesn’t have a lengthy signup process. It doesn’t even need an email address. All users have to do is download it, create a username and add friends. They can they yo each other at any time of the day. Not sure what will compel users to do this all day particularly when you can’t actually have a meaningful conversation through the app. Its only a matter of time before the novelty wears off I guess. Apparently it took the developer only eight hours to create this application, which is certainly not surprising given that it stretches the minimalist concept far too thin. Yo is available as a free download for iOS and Android.